Each trip to the winner’s circle for Russell Baze these days supplants his incredible record of most victories by a jockey in North America. Born in Vancouver,B.C., in August, 1958, his victory total during an illustrious career is approaching more than 11,700. It would be safe to state that the 54-year-old will reach the 12,000 total before he retires. He and Brazil’s Jorge Ricardo have taken turns the last few years as the rider for most wins in the world. His riding career was launched in 1974 at Yakima track in Walla Walla, Wash. Several weeks later he won his won his first race at Yakima Meadows in Yakima, Wash., on Oregon Warrior, a horse trained by his father, Joe Baze. By the early 1980s he was making a name for himself, winning racing titles at northern California tracks. He has perennially been the leading rider at both Bay Meadows and Golden Gate Fields, with over 60 riding titles between the two tracks. 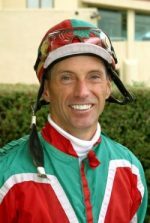 Among his countless riding titles, awards and inductions into the U.S.and Canadian racing Halls of Fame, a highlight of his career came on December 1, 2006, at Bay Meadows in San Mateo, when he eclipsed Laffit Pincay’s North American record for most wins when heregistered his 9,531th victory. Afterwards, Pincay lauded Baze’s work ethic in summing up the Hall of Fame career of the jockey who broke his record. “Russell’s a great jockey. He works very hard and he loves to ride. I knew sooner or later somebody would break my record. He rides good horses, mediocre horses, and bad horses, and he rides them all the same. He gives them everything he has,” said Pincay. Baze has competed at most major U.S. tracks, riding in the Kentucky Derby, Breeders’ Cup and at Woodbine in the Queen’s Plate in 2009. Early in his career he moved his tack to Southern California for three seasons before returning “home. “ Commenting on “The Big Fish in a Small Pond” theory of his career, Baze said, “I like winning but can do without the fame and the glory. 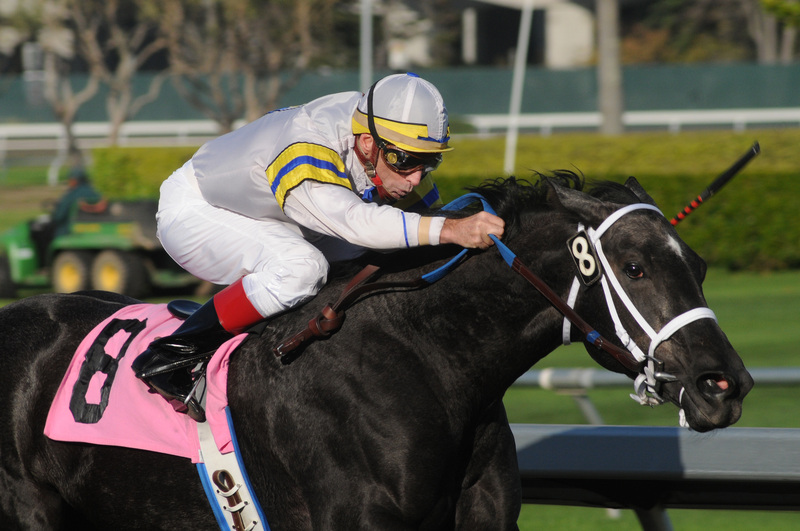 It’s hard to leave a place when you’ve done as well as I have here.” His list of stakes victories, including five in Grade 1 races, is lengthy, one of which was the California Derby. He rode seven winners on a card at Golden Gate Fields and was the regular rider for the exceptional sprinter Lost in the Fog. He also set a turf record for 1 ½ miles at Santa Anita on Hawkster in 1989. Along with his induction into the U.S. Hall of Fame, Baze’s other honours include the prestigious George Woolf Memorial Jockey Award, the Isaac Murphy Award for the highest winning percentage (nine years in a row) and an Eclipse Special Award in 1995 when he became the first jockey to win 400 or more races four years in a row. He didn’t stop there, extending the streak to seven and eventually winning more than 400 races on 13 occasions. Baze has been resilient during 38 years in the saddle, bouncing back from many injuries, including a broken neck, back and pelvis. Baze comes from a family of horsemen. His father, Joe Baze, was a leading rider in northern California and Washington. Russell’s American-born dad was riding at Exhibition Park (now Hastings) in Vancouver at the time of his son’s birth, giving him dual Canadian/American citizenship. His younger brother Dale was a jockey and his cousin, Gary, is a Washington Hall of Fame jockey. Baze lives in Woodside, Calif., and is married with three daughters and one son. On January 25, 2013 marked Russell Baze leaving the starting gate for the 50,000th time in his career. This unprecidented milestone was reached at Golden Gate Fields in San Francisco. Russell’s career stats when he surpassed the 50,000 mark were an extremely impressive 24% win percentage with 56% of his mounts hitting the board. The only other riders to reach the 50% + threshold are Pat Day and Chris McCarron.